Design: Oathtaking of Vice President Jejomar Binay, June 30, 2010, Quirino Grandstand, Rizal Park, Manila. Administered by Supreme Court Associate Justice Conchita Carpio-Morales, while his wife, Dr. Elenita Binay holds the Holy Bible. Jejomar "Jojo" Cabauatan Binay (born November 11, 1942) is the 15th and incumbent Vice President of the Philippines and former mayor of Makati City, Philippines. He is also the President of the United Opposition (UNO), President of Partido Demokratiko Pilipino-Lakas ng Bayan (PDP-Laban), Chairman of Asia-Pacific Region Scout Committee and the President of the Boy Scouts of the Philippines. 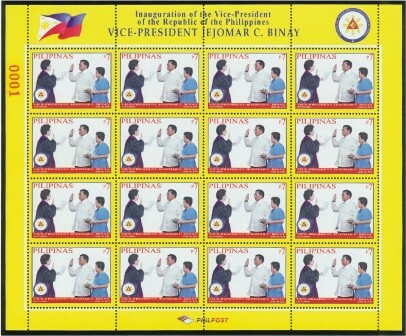 On February 1986, Binay became Corazon Aquino’s first appointed local official after Nemesio I. Yabut died during incumbency as mayor during the EDSA Revolution. Binay joined pro-democracy forces in thwarting the mutinies. His active role in the defense of the Constitution earned him the nickname “Rambotito” (or little Rambo, after the screen hero), the Outstanding Achievement Medal and a special commendation from President Aquino herself. In 2001, Binay was reelected as mayor of Makati, winning over actor-TV host and then vice mayor Edu Manzano via landslide. He won his second term in 2004 by a landslide against 1st District Councilor Oscar Ibay. He ran for his third and last term as mayor in 2007 and won again by a landslide, beating incumbent Senator and actor Lito Lapid. His margin over Lapid has been considered as the largest margin in a local election in Makati City. 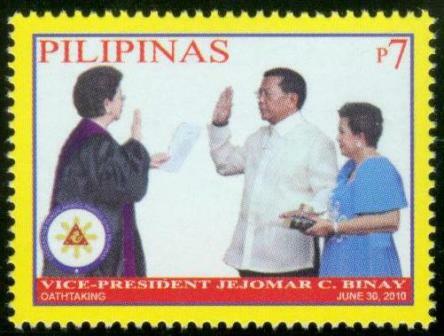 Jejomar Binay was inaugurated as the 15th Vice-President of the Philippines on June 30, 2010. He was the first local government official who became vice president. Binay was appointed as chairman of the Housing Urban Development Coordinating Council (HUDCC) by the President Noynoy Aquino, the same position held former Vice-President Noli de Castro. Additionally, Binay was head of the Task Force OFW in which Overseas Filipino Workers (OFWs) who were harmed by their employers can return to the Philippines at government expense, he is also a Presidential Adviser of OFW concerns.